"Summary: IDF Military Advocate General Mandelblit updated the Ambassador on February 17 on the progress of investigations into allegations of misconduct during Operation Cast Lead, including providing a preview of additional findings to be published before the March 24 Human Rights Council meeting. Mandelblit noted concern with the Palestinian Authority's effort to undermine Israel through the International Criminal Court and hoped the U.S. would weigh in with both the PA and the ICC, and publicly state our view of the ICC's lack of jurisdiction. He warned that PA pursuit of Israel through the ICC would be viewed as war by the GOI. No decision had been made regarding an independent commission to review the IDF investigations. Mandelblit noted what he viewed as the lack of political and popular will to initiate such an inquiry at this time, and suggested that given differences of opinion within the government, the question would be held in abeyance as his investigation progressed. End Summary." So, the grand strategic sands are shifting, as described below. Yesterday's UN vote reinforced this shift. It remains to be seen if Israel would still consider the ICC option to be an act of war, should the Palestinians decide to invoke it, not to mention whether or not the United States would stand by Israel, if Israel acted on such a consideration. The ceasefire agreed by Israel and Hamas in Cairo after eight days of fighting is merely a pause in the Israel-Palestine conflict. It promises to ease movement at all border crossings with the Gaza Strip, but will not lift the blockade. It requires Israel to end its assault on the Strip, and Palestinian militants to stop firing rockets at southern Israel, but it leaves Gaza as miserable as ever: according to a recent UN report, the Strip will be ‘uninhabitable’ by 2020. And this is to speak only of Gaza. How easily one is made to forget that Gaza is only a part – a very brutalised part – of the ‘future Palestinian state’ that once seemed inevitable, and which now seems to exist mainly in the lullabies of Western peace processors. None of the core issues of the Israel-Palestine conflict – the Occupation, borders, water rights, repatriation and compensation of refugees – is addressed by this agreement. The fighting will erupt again, because Hamas will come under continued pressure from its members and from other militant factions, and because Israel has never needed much pretext to go to war. In 1982, it broke its ceasefire with Arafat’s PLO and invaded Lebanon, citing the attempted assassination of its ambassador to London, even though the attack was the work of Arafat’s sworn enemy, the Iraqi agent Abu Nidal. In 1996, during a period of relative calm, it assassinated Hamas’s bomb-maker Yahya Ayyash, the ‘Engineer’, leading Hamas to strike back with a wave of suicide attacks in Israeli cities. When, a year later, Hamas proposed a thirty-year hudna, or truce, Binyamin Netanyahu dispatched a team of Mossad agents to poison the Hamas leader Khaled Meshaal in Amman; under pressure from Jordan and the US, Israel was forced to provide the antidote, and Meshaal is now the head of Hamas’s political bureau – and an ally of Egypt’s new president, Mohamed Morsi. Operation Pillar of Defence, Israel’s latest war, began just as Hamas was cobbling together an agreement for a long-term ceasefire. Its military commander, Ahmed al-Jabari, was assassinated only hours after he reviewed the draft proposal. Netanyahu and his defence minister, Ehud Barak, could have had a ceasefire – probably on more favourable terms – without the deaths of more than 160 Palestinians and five Israelis, but then they would have missed a chance to test their new missile defence shield, Iron Dome, whose performance was Israel’s main success in the war. They would also have missed a chance to remind the people of Gaza of their weakness in the face of Israeli military might. The destruction in Gaza was less extensive than it had been in Operation Cast Lead, but on this occasion too the aim, as Gilad Sharon, Ariel’s son, put it in the Jerusalem Post, was to send out ‘a Tarzan-like cry that lets the entire jungle know in no uncertain terms just who won, and just who was defeated’. 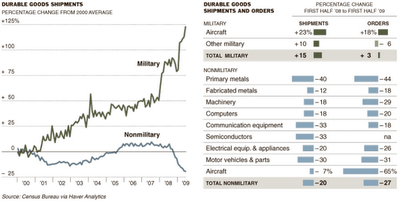 Will Military-Industrial-Congressional Complex Heave the Middle Class Off the Fiscal Cliff? The essay — America the Third World Nation in Just 4 Easy Steps, (Truthout, 10 Nov 2012) — describes how our political addiction to the free-trade ideology of neoliberal economics has helped to de-industrialize America and thereby impoverish much of the American middle class. 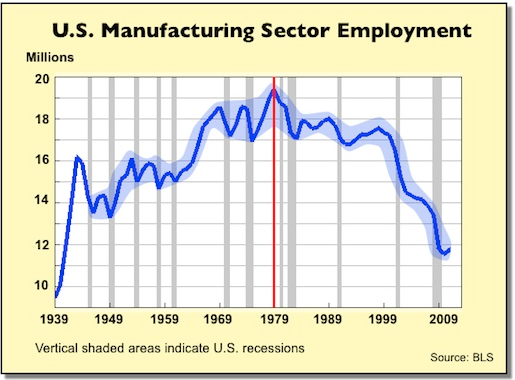 My 24 Sept essay in Counterpunch describing decline of manufacturing employment gives you a sense of the mind-boggling magnitude of what has happened. While “4 Easy Steps” makes passing references to the increasing dependence of the manufacturing sector on military spending, as well as the financialization of economy (but not the latter’s siamese-twin ‘managerialism’), the authors did not develop these points. Without implying any criticism of their excellent essay, my aim today is to tweak your interest in these omissions, particularly America’s defense dependency. The late Professor Seymour Melman (Columbia Univ.) wrote a prescient book, Profits Without Production (Knopf, 1983) that explained how the militarization and managerialization of our economy were becoming the central causes of the decline in America’s manufacturing competitiveness. This decline started in the 1970s, but Melman showed how it grew out of seeds planted by the permanent military mobilization of a huge defense industry in the 1950s. 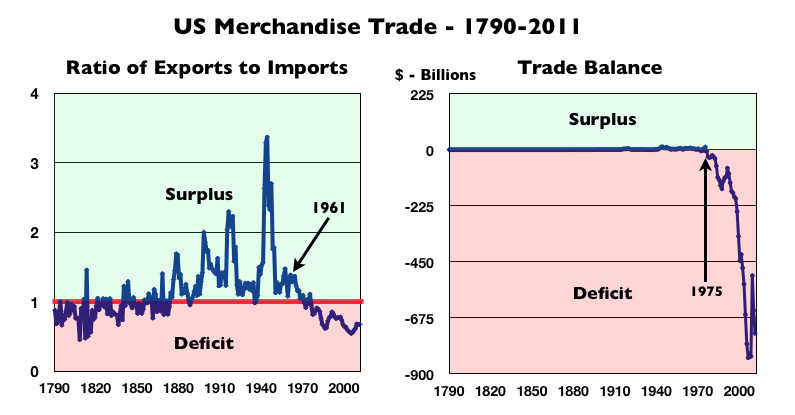 The post WWII economic boom in the US (note: our competitive performance was aided in part by the lingering effects of the WWII damage to the US’s other major industrial competitors) hid the adverse economic effects of the economic diversion attending to the permanent war economy unleashed by NSC-68. Nevertheless, by early 1961, the accumulating economic and political damage caused by the diversion concerned some insiders: President Eisenhower famously warned the nation about the rise of misplaced power posed by the rise of a large permanent standing arms industry, which he said pointedly was new in our national experience. The accumulating damage wrought by the permanent war economy started to accelerate in the 1970s, and by 1980, the cancer metastasized: militarization and managerialization began to openly thrive and grow at the expense of the traditional high-wage manufacturing sector, in effect, siphoning off money flows via a combination of government handouts and favorable tax treatment that in effect rewarded both the looting of the tax base and the draining of competitiveness and ingenuity from the civilian manufacturing sector (via the increased defense subsidy, leveraged buyouts, offshoring of jobs, emphasizing short-term focus to pump stock prices, etc.) The combined results of the growing defense dependency, managerialization, and financialization was a decreasing international competitiveness in the manufacturing sector. At the same time, our global competitors were increasing their competitiveness. 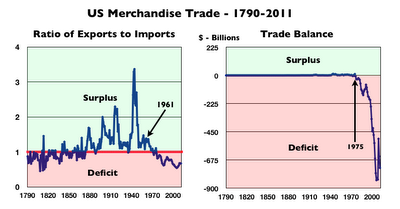 The net effect can be seen in the US merchandize trade deficit; it went into free fall after 1980. Those who believe that subsidized defense technologies spill over into the commercial sector to improve international competitiveness might want to consider the obvious fact that the huge increases in the defense spending between 1977 and 1987 and 1998 and 2012 clearly did nothing to ameliorate the free fall. In America, this political-economic evolution has created a weird political situation where a peculiar political darwinism (taking the form of a corporatist alliance of big business and the federal government) co-exists with the neo-liberal ideology of social darwinism. The former stresses mutual dependency and government subsidies for survival while the latter stresses individuality and survival of the fittest in a Hobbesian Universe. Yet the contradiction between the two modes of belief does not impede the ideologues from promoting both simultaneously, and in so doing, continue the looting and draining operations. That cognitive dissonance is now poised to grow much worse in the next few months, if as is likely, the threat of a budget sequester induces the government to impose neoliberal austerity economics on the middle class, while government becomes more imbedded with and protects the banksters, the defense contractors, and its other corporatist allies. That is because the only way to practice America’s peculiar mix of social and political darwinism at the same time is to fling what is left of the middle class off the fiscal cliff by defunding social security, medicare, infrastructure modernization, education, etc. Much has been written on the economic distortions created by the financialization of the economy, but aside from Melman’s pioneering work, little has been written on economic distortions created by the increasing dependency of the manufacturing sector on military spending — which is really a huge government subsidy – and the rise of managerialism, financialization’s deadly siamese twin. Both sets of distortions exist side by side with, but in sharp contrast to, the ideological neoliberal fantasies of a free market. 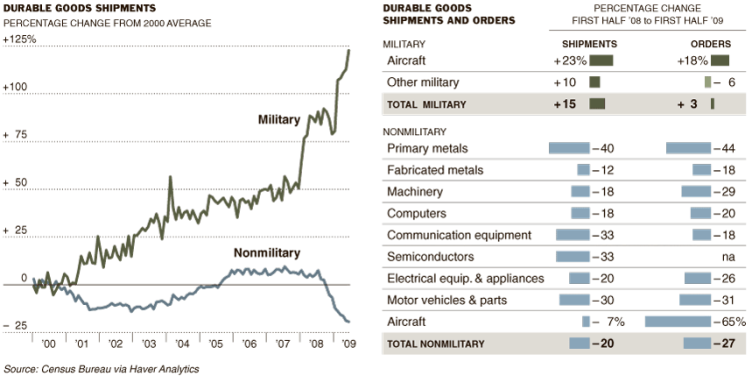 The attached graphic provides a hint — but only a hint — of how the hidden distortions that have been insensibly creeping into the economy: the graphic illustrates how rates of growth in the industrial shipments of military durable goods increased at a much faster rate than shipments of nonmilitary durable goods since 2000. This difference in growth rates reflects the accumulating effects of the huge increases in the defense budget that began in 1998. These differences have worked to increase the disproportionate large share of the de-industrializing manufacturing economy that has been soaked up by the defense industry over time. For example, defense spending (base budget + war costs) in 2011-12 amounted to about 4.4% of the GDP. About one-quarter of this spending was applied to the salaries of military and civil servants. That implies the other three-quarters or about 3.3 percent of GDP was spent on defense goods and services in the private sector. Yet this 3.3 percent of GDP spent on defense goods and services soaked up 11 to 12 percent of America’s total capital goods shipments over the last two years. There are other indicators of the economic distortion caused by the defense dependency: For example, fifty-five percent of the federal R&D budget is now allocated to defense-related activities. In the early to mid 1990s, nationwide employment of scientists and engineers in the defense sector soaked up about 30 percent of the total scientific and engineering talent (public and private sectors). Given the rapid growth in the defense budget and the decline in the manufacturing share of GDP since then, the ratio is likely to be even higher today. Unfortunately, there is little current academic research aimed at understanding the size and meaning of these hugely important preemptions of resources, production capabilities, and human skills. Indeed, most contemporary economists, like the authors of NSC-68, still think of military spending in Keynesian terms as being a general economic stimulus and job creator. But Military Keynesianism, if it ever worked, is certainly not working in the 21st Century. To wit: the largest sustained increases in the defense budget since the end of WWII began in 1998, but this spending binge was accompanied by (1) a sluggish recovery from the March-November 2001 recession to the onset of the Great Recession that began in late 2008 and its even more sluggish recovery; (2) an acceleration in the rate of decline of employment in the manufacturing sector after 1998 (see Figure 2 here); and (3) the unprecedented plummeting of the merchandise trade balance (discussed earlier). There is also academic research suggesting defense spending is one of the least effective way to create jobs via the ‘Keynesian multipliers’ flowing out of government expenditures (see this Univ. Mass study, for example). Defense companies now make up a very substantial part of America’s much diminished industrial base — and these giant defense companies are hooked on the narcotic of defense spending. That, in a nutshell, is why Grumman could not make reliable and affordable buses. That is why the private sector made the internet affordable, reliable, and easy to use, not the DoD which invented it. For interested reader, the essay Why Boeing is Imploding provides a stunning example of how the defense-related engineering and production practices (in this case, political engineering or the practice spreading subcontracts around to build political support for a program) have spilled over to infect Boeing’s civilian production practices. One thing Anders did not mention is that the defense industry is very skilled in lobbying the federal government to increase the public subsidy for making its increasingly unaffordable weapons. Nor did he mention that you buy what you subsidize. In a ‘cost-plus,’ ‘mil-spec’ed,’ single-buyer economy, you subsidize cost growth, so you ‘buy’ costs — the cost overruns in the hugely expensive F-35 Joint Strike Fighter being an outstanding current example (here is just one example in the F-35’s ever growing shop of horrors). Anders made his amazing admission in the 1991 keynote address to the twelfth annual conference sponsored by Defense Week, then a very influential newsletter in the MICC. His intent was to explain why, at the end of the Cold War, General Dynamics had chosen not to diversify its business into the non-defense sector — i.e., why GD was not interested in converting swords into plowshares. Instead, Anders proposed to undertake a takeover strategy to increase its market share in a (temporarily, as it turned out) shrinking defense market. Anders was not alone in thinking along these lines. In fact, his speech was a precursor to the industry-wide, government-subsidized “Pac-Man” consolidation strategy. This strategy was promoted by President Bill Clinton’s then deputy secretary of defense, William Perry, at a 1993 meeting with the defense titans, a meeting dubbed the “Last Supper.” Perry’s strategy led to a rash of industry-wide mergers beginning in the mid-1990s. Significantly, when the defense budget began to grow rapidly after 1998, there has been no undoing of the consolidations, even though rising defense budgets eventually grew to levels exceeding the highest budgets of the Cold War, even after removing the effects of inflation. Today, the defense industry is dominated by three giant all-purpose weapons manufacturers—two of which now have their headquarters in the Washington, DC, area, and the third (Boeing) with a major government relations office in the DC area as well—to more closely supervise their most important corporate activity: the lobbying efforts that influence the money flow out of the Pentagon, Congress, and the White House. Together with the banksters, these immensely powerful companies, their smaller brethren, and the huge supporting cast of gucci-shoed K Street lobbyists, pro-defense think tanks, and the defense trade press are poised to pounce on President Obama and Congress to protect their fiscal honey pot, while the rest of country is heaved over the fiscal cliff. If that essay does not peak your interest in this hugely important subject, nothing will. Unfortunately, you will have to go a used bookseller to find it. ** Caveat emptor: Melman was my friend and I made some minuscule contributions to the research in this book. Who Will Create More Jobs: Romney or Obama? My prediction: The eventual answer will turn out to be a distinction without a difference. Here’s why. Both political parties and their candidates for President now accept neoliberal ideology as being the incontrovertible truth. This belief is more theological than scientific, because neoliberalism has a thirty year track record of not producing the high-paying jobs for the middle class its promisers say it will produce. Quite the reverse would be a more accurate description. According to neoliberal dogma, the only way to stimulate the growth of high-paying jobs for Americans is to unleash the private sector by getting government off the back of business. Therefore, given this truism, the government’s economic purpose is simply to make it easier for the private sector to invest in productive capacity at home — or to use a popular but vacuous buzzword: to invest in the ‘supply side’ of the economy. To this end, the neoliberal policy soup always includes a mix of tax cuts to the investor class, investment incentives and (de)regulations to make life easier for big business, and austerity economics by federal and state governments. Examples include regressive tax cuts, deregulation of oppressive externalities (like environmental protections), union busting (to make wages more flexible on the downside), wage stagnation (no increases in the minimum wage), policy incentives encouraging financialization to increase flexibility of the investor class (rescinding Glass-Steagall), and cutting deficits via offsetting cuts in Federal, State, Local government spending, especially social safety-net programs, while protecting defense production, etc. After over thirty years of trying and failing to create high-wage, middle-class jobs with various mixes of neoliberal snake oil, one might think neoliberal economics would be an issue in the current campaign for president, particularly in view of the fact that each candidate is claiming only he can create jobs. The mismatch between past predictions and performance is mindboggling. Even a superficial look at economic data collected by the Bureau of Labour statistics suggest that the real world behaves very differently from that imagined by the high priests of neoliberal theology. If the contradictions between theory and reality remain unaddressed by the candidates in this presidential election year, you can bet what little is left of your IRA on a prediction that the real problems dragging down the lower 99% will continue to worsen for the foreseeable future. From the end of WWII to the early 1970s, the prime engine of our prosperity was the economic vibrancy of a huge and growing high-wage manufacturing sector, which incidentally, was heavily unionized. The quality and quantity of US production was the envy of the world. And benefits spilled over into the other economic sectors, creating a virtuous cycle that made a growing proportion of the American middle-class better off economically than at any time in human history. To be sure, all was not roses in the Leave-It-To-Beaver America of the 1950s and early 1960s. There were horrible festering sores in our society, particularly segregation and racial persecution, which arbitrarily kept a large portion of our population disenfranchised and in abject poverty. There were also pockets of intractable white poverty in rural America, particularly Appalachia and the Deep South. Nevertheless, it is undeniable that the post-WWII American economy had mutated into a vibrant consumer society, the likes of which were unprecedented for a majority of the working class. In addition to creating large numbers of high-wage manufacturing jobs, the manufacturing sector became the driver of beneficial spillover effects that fed back on and magnified the larger economy, ranging from supermarkets to suburban construction to larger local tax bases supporting social infrastructures, etc. The total size of the American work force grew faster than manufacturing employment, and manufacturing’s share of the total work force declined, even as the absolute number of manufacturing jobs increased. Figures 1 and 2 are designed to give the reader a sense of the magnitude of some of the astounding changes that have taken place since the end of WWII. 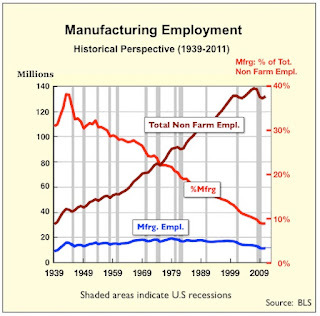 Figure 1 depicts the growth in manufacturing employment (the blue line) and in total non-farm employment (a private sector measure that accounts for about 80% of the total jobs in the U.S., including those in the manufacturing sector). Figure 1 makes clear the extent to which total non-farm employment (the maroon line measured on the left scale) grew faster than manufacturing employment, even though the latter grew in absolute terms between 1939 and 1979, before slipping into a long-term decline. Manufacturing employment is depicted by the blue line, also measured on the left scale — we will look at this measure more closely in Figure 2. The red line (measured by the percentages on the right scale) says it all. 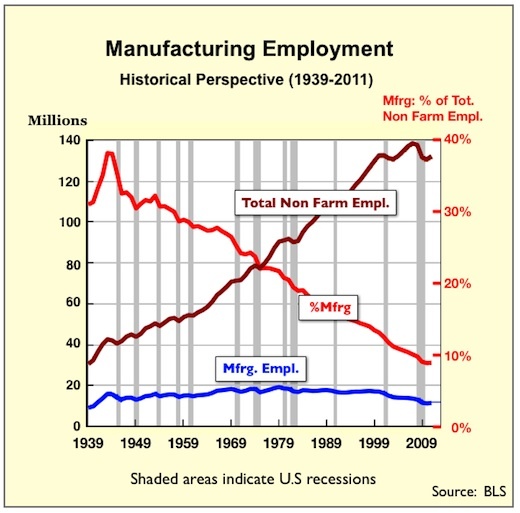 It compares the size of manufacturing employment to the size of total non-farm employment in percentage terms. It has been declining steadily since 1943. In 1950, for example, Figure 1 tells that 31% or almost one out of three jobs in America was in the manufacturing sector. In 1979, manufacturing employment reached its all time high, yet its share of the total workforce had declined to 22%. By 2011, that share plummeted to 9%., or less than one out every ten jobs. One might think the stability of the steadily declining percentage in Figure 1 suggests a kind of normalcy. Such and interpretation would be a grotesque mistake, because it turns out that 1979 was an interesting year in the history of manufacturing jobs. After 1979, what was normal became abnormal or perhaps a “new normal,” to borrow yet another vacuous buzzword. This is not obvious in Figure 1, because the relative flatness of the blue line is driven by the scale of the maroon line. Figure 2 peels back the next layer of the onion. Figure 2 enables us to look more closely at the blue line in Figure 1 by re-plotting on an expanded vertical scale ranging from 9 million to 20 million employees. The numbers behind the blue lines in Figures 1 and 2 are identical. Figure 2 shows more clearly how the dynamics of growth and decline in the manufacturing sector changed over time. To this end, I added the shaded area merely to give the reader a sense of the how the size of short term fluctuations changed over time. After World War II, the total number of manufacturing jobs rose in absolute terms from 13 million in 1946 to an all time high of 19.4 million in 1979. This is an astounding number for peacetime, exceeding that maximum of the WWII’s “arsenal of democracy” employment of 16 million by 20%! The total increase between 1946 and 1979 was of 5.9 million jobs or 44%. After 1979, the total declined to 11.7 million jobs by 2011, a reduction of 40% from a much larger base. What is even more stunning is that employment in the manufacturing sector today is almost half a million people smaller than the 12.1 million employed by the manufacturing sector in January 1, 1941, eleven months before Japan bombed Pearl Harbour, even though the current U.S. population exceeds that of 1941 by 152 million people! But there is more that can be sniffed out of Figure 2, now that we have the benefit of 30 years hindsight. The flat growth and wild swings in employment data (indicated by the greater width of the blue shaded area) show this engine of prosperity began to sputter around 1970 (perhaps because of over heating caused by the guns and butter policy in Vietnam ??? ), before moving into a more coherent pattern of long-term decline after 1979. So, the 1970s turned out to be a period of transition. This is hinted at in the pattern of data in Figure 1: First, note how the pattern of decline became more stable after 1979, with the magnitude of the short term fluctuations being much reduced compared to those of the 1970s. This stabilization also hints at the introduction of deeper causal factors, but does not tell us what they are. Note also that no lost ground was ever fully recovered after the peak in 1979. Each major cyclical short term term peak in employment rose to a level that was less than its predecessor (in one minor case it was about the same). This is even true for the sustained economic growth period of the Clinton Administration, which Democrats like to compare to the Kennedy-Johnson expansion during the 1960s. The failure to recover from successive downturns is yet another hint of long-term causal factors. Regarding these deeper factors, much has been written about de-industrialization, and there is no need to repeat it here. Suffice to say the onset of the stagnation of middle-class wages in the late 1970s corresponds to the loss of high wage manufacturing jobs in a de-industrializing manufacturing sector, reflected by decline after after 1979 in Figure 2. The onset of the explosive growth of consumer debt and the growing inequality of income corresponds with the decline in manufacturing. For those who drank the kool-aid about the information society displacing the manufacturing society, I note that computers and software industries are included in the employment figures of this chart. Indeed, given the quality of the jobs debate by Mssrs. Obama and Romney, one could argue America has entered the post-information age. If either Mr. Obama or Mr. Romney is going to turn around the high-wage job meltdown, they need to explain to the American people how their policies will create a new virtuous cycle of expansion begetting expansion, either by (1) reinvigorating the domestic manufacturing sector, which is a proven engine of virtuous growth, or (2) by inventing a new engine of virtuous growth to replace the role that manufacturing served between the end of WWII and the early 1970s. Creating jobs to flip hamburgers at McDonalds or slosh ice cream at Ben and Jerry’s will not do the trick. Military Keynesianism — i.e, shoveling money into weapons manufacturing — certainly worked in WWII, and it may have worked more modestly in the late 1940s and the early 1950s, although given the anguish of Eisenhower’s farewell address, my guess is that he may have thought Military Keynesianism created more problems than it solved. Whether or not that was the case by 1961, one thing is clear from Figure 2 in this regard: Throwing money at the Pentagon over the last 30 years has been a total bust in terms of stimulating any growth in manufacturing employment, not to mention Military Keynesianism’s complete failure to re-igniting anything remotely similar to a virtuous cycle of prosperity begetting prosperity. Romney’s choice of the Chairman of the House Budget Committee, Congressman Paul Ryan, as his running mate mirrors John McCain’s disastrous choice of Sarah Palin four years ago, although Ryan is probably a more able politician. Being smarter than Palin, Ryan’s plutocracy-enriching budget proposals suggest he is also a more hypocritical politician, although such a distinction in Versailles on the Potomac during the summer of 2012 may be a case of splitting hairs. It is a well known fact that like his predecessor candidate for President, John McCain, Romney will never be trusted by hard-right populists energizing the looney base of the Republican Party. So, like McCain, Romney has picked a superficially attractive hard-right nutcase as a running mate in a forlorn attempt to energize his party’s crazy base. Once again the mainstream media is going gah gah over the brilliance of the choice. If you doubt this, google the choice of Palin and compare that gushing to today’s gushing. In so doing, Romney, like McCain, is setting himself up for a slaughter by Mr. Obama, whose historical role is rapidly becoming one of being the Great Enabler of the oligarchy that is taking over the United States. Obama, if nothing else, has proven himself to be a brilliant exploiter of his opponent’s political weaknesses. Barring some unforeseen exogenous disaster, like a terrorist attack or another Wall Street collapse, Mr. Obama’s looming slaughter of Romney is almost a certainty. In a moral sense, Romney is far slimier than McCain: McCain, for all his political warts, did distinguish himself under torture as a POW. On the other hand, Romney, unlike those who avoided Vietnam for moral reasons, is just another creepy Chickenhawk draft dodger who professed warlike support for Vietnam, while using his religion (rather than graduate school or marriage with children) to the avoid the pain and inconvenience of that war. Whereas McCain spent his entire life in what he can legitimately view as patriotic (if sometimes misguided, IMO) national public service, Romney can only view himself as a patriot in the shallowest, most opportunistic sense of the term. It is a well established fact that Romney is really a member of the unpatriotic global plutocratic elite who worked assiduously to enrich himself at America’s expense by doing his bit to destroy the American job machine while protecting his ill begotten gains in offshore tax havens. Therefore, at the moral level of political conflict, Romney is far more vulnerable than McCain, and as I explained in November of 2008 in The M&M Strategy: How Obama Won, Mr. Obama waged a brilliant political campaign to maneuver Mr. McCain into destroying himself at the moral level of political combat. Obama has proven he intuitively understands the moral game. Yet, by pandering to his base, and repeating McCain’s strategic mistake, Romney has pitted his own weakness against Obama’s demonstrated strength. The last thing we need is a warmongering President who does not understand Sun Tzu. As I suggested in the The Enablers, my review of Mike Logren’s important new book, The Party’s Over, Mr. Obama is just another enabler of the plutocratic power that is destroying America. An Obama landslide will work also to shore up the ongoing entrenchment of that power. At the same time, an Obama landslide will fuel the mistrust, alienation, and racist anger of the Right, and therefore work to increase its control of the Republican base during Obama’s second term. This dynamic will very likely set the stage for a repeat performance by some other Democratic enabler in 2016. On the other hand, my guess is, unlike his first landslide, another Obama landslide will not generate much in the way of coattails in Congress. Mr. Obama and the Democrats in control of Congress between 2008 and 2010 had squandered their first set of coattails by 2010, and the same crowd is not likely to get a second chance. So, we can expect yet more gridlock and more of the same, and while enabler Democrats get an increasing lock on the Presidency and the crazies strengthen the control of the Republican base, the bloated plutocrats can laugh all the way to the bank. Despite this rosy scenario for enriching plutocratic power in the coming years, history tells us that sooner or later, the insatiable greed of any oligarchy overreaches itself and becomes intolerable to impoverished masses who think they have or should have a voice in selecting their political leaders. When that tipping point is reached, the political system becomes ripe for revolution. In our case, I think a more likely result will be an American version of a fascist revolution on the right than a social justice revolution on the left. The vanguard of a neo-fascist revolution will be the impoverished, radicalized, middle class, minority white men who need jobs, but feel their opportunities have been screwed by the alien “others” in our increasingly diverse population. This is an outlook that can be easily exploited by ruthless politicians to shift the focus of their anger onto other victims of the very same plutocrats who created the intolerable conditions in the first place. Of course, the vanguard of an American neo-fascist revolution, like the brownshirts of the 1920s and 1930s, will be snookered into working for the further entrenchment of the oligarchy, perhaps eventually opening the door for an election victory (via another stolen election like that of 2000?) of a right wing fanatic instead of an enabler. Whoever he or she might be, the fanatic, like the Enabler, will be beholden to the oligarchy; but unlike the Enabler, the fanatic will be far more predisposed to go all the way toward establishing an overt police state, giving the thuggish domestic policing jobs (in the military, police forces, and private security firms guarding our gated communities, etc) initially to members of the angry mob . If such a scenario unfolds, it is a virtual certainty that it will be accompanied by an even more militaristic foreign policy, because war (and the patriotism and money flows it engenders) is the surest way to distract the attention of the increasingly impoverished masses from the reality of their growing disenfranchisement. It seems to me that some kind of neo-fascist evolution will be far more likely at this point than a revolt led by the fops of the enervated left, who are more at home in the brie and chablis salons of the Upper West Side, Versailles on the Potomac, and in the gated communities springing up across America than in the diners of Akron or Steelton or in the poor black/hispanic urban and rural ghettoes spreading across our land. Is such an evolution our pathway into the future? No one can say. But, it seems to me that Romney’s idiotic choice, coupled with the dynamics of Democratic enabling are setting up an interplay of chance and necessity that makes this kind of evolution more and more possible, if not probable. Ironically, as I write about this dismal prospect early on a Sunday morning, I am lying at anchor (my home is now a small sailboat) in Gaeta, Italy, next to the USS Mount Whitney, flagship of the Navy’s 6th Fleet (she is home ported here) listening to the Star Spangled Banner accompanying the morning flag-raising reveille. The music and ceremony still sends a chill up my spine and I am reminded of my days in uniform which I am still very proud of. Readers beware; what follows is a biased book review. The author Mike Lofgren (bio) is a very close friend of mine, and, as some of you may may already know, I have been flogging his important new book, The Party Is Over: How Republicans Went Crazy, Democrats Became Useless, and the Middle Class Got Shafted. Mike is a conservative of the now forgotten old school, more at home with the likes of Robert Taft, Eisenhower, and Lincoln than right wing ideologues like Newt Gingrich or plutocratic highway robbers like Mitt Romney. Casual readers of Lofgren’s aptly titled book may well conclude that he is harder on Republicans than Democrats. In a technical sense this is true. Having served on the Republican staffs of the House and Senate Budget Committees, he was in a much better position to observe and understand their hijinks than those of the Democrats. So, it is not at all surprising that his book has more detail describing how the ideological Republican crazies created the current political-economic mess that is poisoning our culture and wrecking our economy. But it would be a great mistake to conclude that Mike is arguing that the Republicans are THE culprits. This book is about how the Republicans and Democrats worked together to sell out the middle class. The author is a modest, unassuming individual, who at first glance would appear unlikely to write such a book. He never sought the kleig lights. He never hung out with the gucci shoe crowd to pave his way into high paying lobbying job on K Street. Lunch for Lofgren was not at the Prime Rib or Capital Hill Club, but a simple sandwich in a brown bag. This modesty of life style and demeanor hides a principled intellectual, who has the character to go where his reasoning and observation take him. And a pen in Lofgren’s deft hands, combined with his deep understanding of political history and acid sense of humor, becomes a sharp, deeply penetrating harpoon aimed at the heart of his subject. In addition to harpooning the bloated degenerate Republican whale, Mike harpoons the Democrats by demonstrating subtly, yet persuasively, how their growing “uselessness” arose out of an enervating sense of entitlement to power. That sense of entitlement mutated Democrats into what we in the Pentagon would call THE ENABLERS of Republicans. The Democratic enablers unwittingly played a crucial role in the demolition of the American dream, not unlike that played by infiltration troops in blitzkrieg. Infiltration troops soften up the front by wiggling through defenses to create holes and weak areas for the tanks to roar thru and reap chaos and destruction in the enemy’s rear area. Only in this case, the rear area being ruined is the American middle class and the role of tanks is taken up by the flow money supplied by the oligarchs who feather their nests by buying Democrats as well as Republicans in one seamless auction. Put bluntly, to protect their sense hereditary entitlement to the power bequeathed by the coattails of FDR and the New Deal, the Democrats abandoned their progressive heritage and moved to Wall Street, Big Pharma, Defense, etc., insensibly becoming faux Republicans. If you doubt this, look at the enervating, quasi-neoliberal ramblings of the self-inflating Democratic Leadership Council (DLC) or the cynical triangulations and warmongerings of Messrs. Clinton and Obama. Their abdication of progressive principles gave Republican crazies more room to get even crazier, and together the faux Republicans and the real crazy Republicans reinforced each other to create a rightward shift in the American political dynamic that unleashed the evolution of a new gilded age, together with the re-emergence of a plutocracy that Russian oligarchs would envy. And this happened in a remarkably short time of 30 to 40 years. In so doing, the Democrats sold out their constituency and colluded in the historic swindle that brought the great American middle class to the brink of impoverishment and debt peonage. If you think collusion is too strong a term, I would urge you to think about Bill Clinton’s (the DLC’s choice for president in the 1992 election) collusion with Republicans in the nullification of the Depression era Glass-Steagle Act in 1999, which was one of the main deregulatory initiatives that unleashed the excesses that led to the 2007-8 financial meltdown. Clinton, by the way, did not pick up his grips and retire to a modest house in Independence Missouri like Harry Truman; he chose instead to join the plutocratic elite, where he is now well on his way to becoming a card-carrying member of the one-tenth of one-percent club of the mega rich. The bottom line: the Democrats’ sense of entitlement and the consequent corruption of their progressive principles have been a necessary, if not sufficient, cause of the current political-economic mess that is destroying what is left of the middle class in our good ole USA. It would be a great mistake to allow the hilariously disgusting Republican hijinks in Logren’s masterpiece brand it as an anti-Republican polemic and miss his main message. Mike, of course, states clearly that his subject is how the madness of the Republicans and the uselessness of the Democrats reinforced each other over the last 30 to 40 years to hose the American People. It is the degenerate nature of this symbiotic relationship that is his and should be the Left’s call to arms. I do not count on this happening. I expect the faux Republicans will try to exploit the embarrassment of riches in Mike’s book for a narrow short-term political advantage, in yet another demonstration of the hypocrisy that is a consequence of their losing mentality. In closing, I ask readers to think about the fact that this laudatory review of The Party Is Over appeared in Pat Buchanan’s American Conservative magazine, not some Democratic rag trying to get leverage in the coming Presidential election. That should be taken by the Left as an example to emulate. The real question in my mind is whether progressive counterparts to the American Conservative will use Mike’s call to arms to summon the curiosity and the courage to explore the ramifications of Lofgren’s subtler analysis of the “enablers” of decline. Think of it. A day set aside to acknowledge the valor and sacrifices of our servicemen was announced by an official Defense Department poster that celebrated Hardware and ignored people. If you think this mentality was an artifact of the Clinton Administration or the Democrats, think again. It was and remains bi-partisan. Ironically, Cohen was formerly a pro-defense Republican Senator from Maine (read shovel money to the warship builders at Bath Iron Works). After leaving the Spendagon, he flew through the revolving door and today, he is a high-powered consultant and ‘senior stateman’ making money by helping to lubricate the flow of funds through the halls of Versailles on the Potomac. He was and remains an advocate of monstrous defense budgets. When he took the job in 1997, Cohen promised to oppose President Clinton, if Cohen felt the Defense Department was being short shrifted. Moreover, in the 1980s, as a Republican senator, Cohen claimed to be a a member of the bi-partisan Military Reform Caucus. Of course, like most Senators, he never attended its meetings, because if he had, he might have realized the motto of the Reform Caucus was People – Ideas – Hardware — in that order! But Cohen was not alone in poster obscenity. Significantly, at the time, no general or admiral in any military service objected publicly to this slanderous poster. In fact, it was not even noticed by anyone in the Pentagon, on Capitol Hill, or in the press, for a very simple reason: The poster accurately accurately reflected the business-as-usual, core values of the MICC. After the second poster came out in 1998, Colonel GI Wilson, then an active duty Marine and close friend, and I went ballistic. We raised holy hell in emails, on the Internet, in meetings, in the halls, with news reporters, and any one who would listen. We both can say with satisfaction that the poster outrage ended up in the dustbin of history, and by 1999, we had a poster with people on it. When you consider the fact that we are proud of the fact that helped to people back on the Armed Forces Day poster, you get an idea of how deep the rot is. If you think this is ancient history, read Kristof’s article carefully, in its entirety, and you will see that the value system that produced the obscene 1998 Armed Forces Day poster remains in place. Then go on the Internet and google articles describing the current round of service downsizing plans (which means pushing people out the door) to make room for high cost cold-war inspired turkeys like the Joint Strike Fighter, nuclear submarines, ballistic missile defense systems, etc., simply because the rate of growth in the defense budget is being cut back. And the next time you hear someone in the MICC waving the flag and saying the MICC’s top priority is supporting the grunts, slugging it out in mud and dust of war, remember the poster — and follow the money. So I ask you, can there be any wonder why we neglect our veterans trying to cope with PTSD in the manner that Kristoff described or the ominous problems of moral hazard described by Major Tyler Boudreau in this paper?